Queen Silvia of Sweden (born Silvia Renate Sommerlath on 23 December 1943) is the spouse of King Carl XVI Gustaf and mother of the heir apparent to the throne, Crown Princess Victoria. 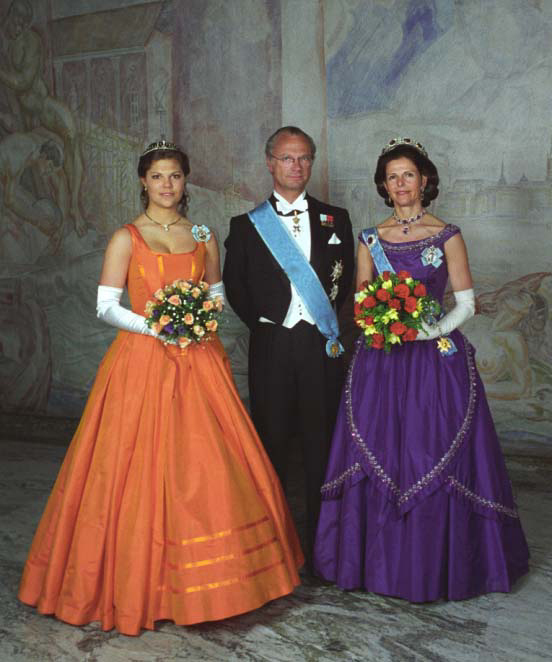 In 2011, Silvia became the longest-serving queen of Sweden, a record previously held by Sophia of Nassau. Silvia Renate Sommerlath was born in Heidelberg, Germany, on 23 December 1943, the only daughter of Alice (née Soares de Toledo) and Walther Sommerlath. Her father was German and her mother was Brazilian. She has two older brothers: Ralf and Walther Sommerlath. They and their families were guests at the 2010 wedding of Victoria, Crown Princess of Sweden, and Daniel Westling  and the wedding of Princess Madeleine in 2013. Her third brother, Jörg Sommerlath, died in 2006. The Mother-Child House Jörg Sommerlath in Berlin, operated by Queen Silvia's World Childhood Foundation, is named after him. She has some fluency in Swedish Sign Language, a national sign language used by the deaf community in Sweden. During the 1972 Summer Olympics, Silvia Sommerlath met Crown Prince Carl Gustaf. In a later interview, the King explained how it just "clicked" when they met. After the death of King Gustaf VI Adolf on 15 September 1973, Carl XVI Gustaf succeeded to the throne. He and Silvia announced their engagement on 12 March 1976 and were married three months later, on 19 June in Stockholm Cathedral ("Storkyrkan Cathedral") in Stockholm. It was the first marriage of a reigning Swedish monarch since 1797. The wedding was preceded, the evening before, by a Royal Variety Performance, where the Swedish musical group ABBA performed "Dancing Queen" for the very first time, as a tribute to Sweden's future queen. In July 2002, the Queen became the unwelcome subject of international curiosity when an article published in the syndicalist newspaper Arbetaren reported that German state archives record that the queen's father, Walther Sommerlath, joined the Nazi party's foreign wing, the NSDAP/AO, in 1934, when he was living in Brazil and working for a German steel company. In December 2010, Queen Silvia wrote a letter of complaint to Jan Scherman, the CEO of TV4, the network that had aired a documentary about her father's alleged Nazi past. Queen Silvia commissioned a report from World War II expert Erik Norberg, a choice which was criticized due to Norberg having ties to the royal family. In his report, Norberg argued that the Queen's father had in fact helped the owner of the steel-fabrication plant, a Jewish businessperson, escape from Germany by taking over the factory. In a December 2011 interview for Channel 1 with Sweden's public service broadcaster Sveriges Television, Silvia called media's handling of the information about her father "character assassination". Queen Silvia established Mentor International in 1994 in collaboration with the World Health Organization. Her vision was to offer mentoring as inspiration, empowerment, and motivation for young people to make healthy life choices and view their futures more positively. Mentor's work has been recognized by the United Nations Office on Drugs & Crime, the Organization of American States, and the Council of Europe. She is now an honorary board member of Mentor Foundation. She was also a co-founder of the World Childhood Foundation in 1999, having been inspired by her work as Patron of the first World Congress against Commercial Sexual Exploitation of Children held in Stockholm. She has also been involved in the Global Child Forum, which she helped initiate, as a keynote speaker in several forums. Her commitment to the work with dementia and the care of the elderly at the end of life is also well known and respected. On her initiative, Silviahemmet was established in Stockholm. It works to educate hospital personnel in how to work with people suffering from dementia, and also initiates research in the area. ^ "Biography - Sveriges Kungahus" (in Swedish). Kungahuset.se. Retrieved 9 February 2012. ^ "Royal wedding guest list published". Stockholm News. Archived from the original on 19 June 2010. Retrieved 7 April 2016. ^ "Startpage". Childhood. Retrieved 9 February 2012. ^ "Essener LVR-Schule zu Gast bei Königin Silvia von Schweden" [Students of an LVR School in Essen visit Queen Silvia of Sweden] (in German). 8 April 2009. Retrieved 7 April 2010. ^ Berlin, by Allan Hall in. "Swedish queen's family 'made fortune from Jewish factory seized by Nazis'". Telegraph.co.uk. Retrieved 2017-01-23. ^ "Silvia klagade på naziprogram – i brev till TV 4:s vd". Aftonbladet. 31 December 2010. ^ "Swedish queen's report denies father had Nazi links". BBC News. 9 August 2011. Retrieved 7 April 2016. ^ Åter med kungafamiljen, SvT Channel 1, 29 December 2011. ^ "Startpage". Childhood. Archived from the original on February 24, 2012. Retrieved 9 February 2012. ^ "Queen Silvia of Sweden and HRH Princess Haya open Global Child Forum". Emirates News Agency. Archived from the original on 2017-02-02. Retrieved 2017-01-23. ^ "Queen Silvia wore this tiara for a dinner in 1987. | Leuchtenberg Sapphire Tiara | Pinterest | Tiaras, Queens and Dinners". Pinterest. Retrieved 2016-04-07. ^ "KÖNIGIN SILVIA-BERNADOTTE-Adel-Royal-ORIGINAL POSTCARD-Monarchie-Königshaus | eBay | Royals | Pinterest | Tiaras, Ebay and Queens". Pinterest. Retrieved 2016-04-07. ^ "June 13, 2015.. The Royal ladies of Sweden... Queen Silvia of Sweden | ♔♛Royalty - Sweden♔♛ | Pinterest | Sweden, Queens and Royals". Pinterest. Retrieved 2016-04-07. ^ "Queen Silvia wore this tiara for the 2012 Nobel Prize Ceremony and Dinner. | Leuchtenberg Sapphire Tiara | Pinterest | Sweden, Queens and Nobel Prize". Pinterest. Retrieved 2016-04-07. ^ "Swedish Queen Silvia. She looks just like her daughter, Princess Victoria in this picture! | Royalty - Swedish Royal Family | Pinterest | Royal Families, Queenâ€Ś". Pinterest. Retrieved 2016-04-07. ^ "Queen Silvia (Sue wrote, "A queen with tan lines, I love it." | History: European | Pinterest | Queens, Tan Lines and Sweden". Pinterest. Retrieved 2016-04-07. ^ "Queen Slivia of sweden Photos: Christening of Princess Estelle of Sweden | Princess Estelle, Sweden and Queens". Pinterest.com. Retrieved 2016-04-07. ^ "The Royal Order of Sartorial Splendor: Royal Splendor 101: Family Jewel Foundations | Tiaras & trinkets | Pinterest | Sweden, Tiaras and Queens". Pinterest. Retrieved 2016-04-07. ^ "elegantempress: Queen Silvia and Daniel on his wedding day to Crown Princess Victoria. This is a great pic! | Royalty - Swedish Royal Family | Pinterest | Weddâ€Ś". Pinterest. Retrieved 2016-04-07. ^ "Swedish Ruby Jubilee Part 1 | Reign, Queens and September". Pinterest.com. Retrieved 2016-04-07. ^ Toast photo during the Gala Dinner of the State Visit of Argentine President to Sweden, on 1998-05-26. Ph: Erhan Güner/SCANPIX SWEDEN (Id:sdlsp098835). ^ "Photographic image". Corbisimages.com. Archived from the original on 2016-03-03. Retrieved 2016-04-07. ^ "Reply to a parliamentary question about the Decoration of Honour" (PDF) (in German). p. 551. Retrieved 28 November 2012. ^ "Princess Birgitta, wearing a diamond bracelet as a tiara. | Jewels, Royals, tiaras | Pinterest | Diamond Bracelets, Tiaras and Princesses". Pinterest. Retrieved 2016-04-07. 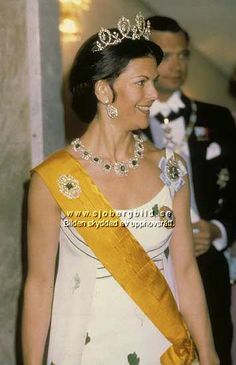 ^ "Queen Silvia wore this tiara for one of the dinners during the Swedish State Visit to Belgium in May 2001. | Nine Prong Tiara | Pinterest | Funny Faces, Belgiu…". Pinterest. Retrieved 2016-04-07. ^ "Queen Silvia wore this tiara for a dinner during the Swedish State Visit to Brunei in February 2004. | Nine Prong Tiara | Pinterest | Tiaras, Queens and US sta…". Pinterest. Retrieved 2016-04-07. ^ "Queen Silvia wore this tiara for the dinner celebrating Queen Margrethe II of Denmark's Ruby Jubilee in January 2012. | Leuchtenberg Sapphire Tiara | Pinterest…". Pinterest.com. Retrieved 2016-04-07. 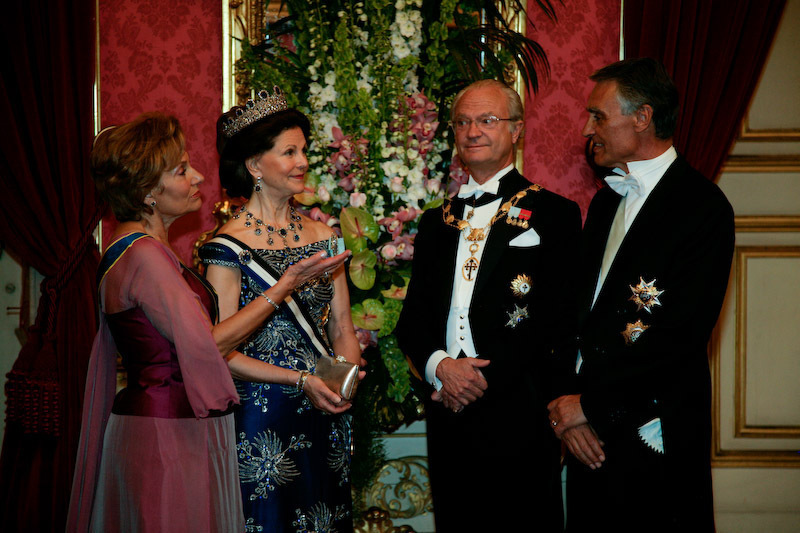 ^ "Queen Silvia wore this tiara for the last dinner during the Swedish State Visit to Denmark in May 2007. | Connaught Tiara | Pinterest | Denmark, Tiaras and Que…". Pinterest. Retrieved 2016-04-07. ^ "Pure Danish Glitter". Angelfire.com. Retrieved 2016-07-16. ^ "Vabariigi President". President.ee. Retrieved 2016-04-07. ^ "Vabariigi President". President.ee. 2011-01-18. Retrieved 2016-04-07. ^ "Six various photographic images". Reservoirphoto.com. Retrieved 2016-04-07. ^ "HM Queen Silvia of Sweden wearing the Leuchtenberg Sapphire Parure from the Swedish Royal Jewels | Jewels Fit For A Queen | Pinterest | Queens, Royal Jewels an…". Pinterest. Retrieved 2016-04-07. ^ "Queen Silvia | Royal Style, Maternity Wear | Pinterest | Queens". Pinterest. Retrieved 2016-04-07. ^ "Queen Silvia wore this tiara for the dinner during the German State Visit in May 2003. | Nine Prong Tiara | Pinterest | Tiaras, Queens and US states". Pinterest. 2014-12-26. Retrieved 2016-04-07. ^ "Photos and Pictures - Pope John Paul II with King Carl Gustav, Queen Silvia, Princess Madeleine, Prince Carl Philip and Princess Victoria 1991 Photo by Reportagebild-ipol-Globe Photos, Inc". Imagecollect.com. Retrieved 2016-04-07. ^ Seegers Press, Photo from State visit of Swedish Royal Family in Iceland, theroyalforums.com; accessed 7 April 2016. ^ "Fálkaorðuhafar". Falkadb.forseti.is. 1981-10-26. Archived from the original on 2016-03-13. Retrieved 2016-04-07. ^ "Queen Silvia wore this tiara for one of the dinners during the Swedish State Visit to Iceland in September 2004. | Nine Prong Tiara | Pinterest | Iceland, Tiar…". Pinterest. Retrieved 2016-04-07. ^ "Queen Silvia wore this tiara for one of the dinners during the Swedish State Visit to Iceland in June 1987. | Connaught Tiara | Pinterest | Iceland, Tiaras and…". Pinterest. 2015-01-18. Retrieved 2016-04-07. ^ "Queen Silvia wore this tiara for the second dinner during the Swedish State Visit to Japan in March 2007. | Connaught Tiara | Pinterest | Tiaras, Queens and US…". Pinterest. Retrieved 2016-04-07. ^ Getty images, State visit of Sweden in Japan 2007. ^ "Lietuvos Respublikos Prezidentė" (in Lithuanian). Lrp.lt. Archived from the original on April 19, 2014. Retrieved 2016-04-07. ^ "Lithuanian president: Swedish royal visit is consolidation of bonds between the countries - News in English - LRT". Lrt.lt. 2015-10-08. Retrieved 2016-04-07. ^ "Visite d´Etat en Suède - Cour Grand-Ducale de Luxembourg - Avril 2008". Monarchie.lu. 2008-04-15. Retrieved 2016-04-07. ^ "Queen Silvia wore this tiara for the dinner during the Luxembourg State Visit in April 2008. | Leuchtenberg Sapphire Tiara | Pinterest | Luxembourg, Tiaras and…". Pinterest. Retrieved 2016-04-07. ^ State Visit of Malaysian King in Sweden, 2005, King Carl XVI Gustav & Queen Silvia during gala dinner, theroyalforums.com; accessed 7 April 2016. ^ "The Royal Watcher : Photo". Royalwatcher.tumblr.com. Retrieved 2016-04-07. ^ "King Carl XVI Gustaf of Sweden, Queen Sonja of Norway, Queen Silvia of Sweden, and King Harald V of Norway attend a dinner gala during the Swedish … | Pinteres…". Pinterest.com. Retrieved 2016-04-07. 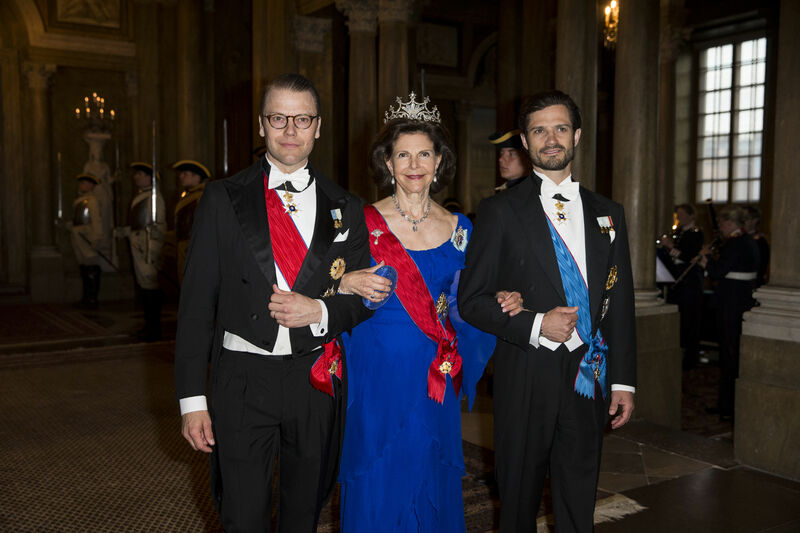 ^ "Queen Silvia of Sweden wearing the Braganza (or Bragança) tiara. Composed of arabesques, flowers, and leaves depicted in diamonds and mounted in go… | Pinteres…". Pinterest.com. Retrieved 2016-04-07. ^ "King Harald V and Queen Sonja of Norway with Crown Princess Victoria, Queen Silvia, and King Carl XVI Gustaf of Sweden during the Norwegian State V… | Pinteres…". Pinterest.com. Retrieved 2016-04-07. ^ "Photographic image". Gpdhome.typepad.com. Retrieved 2016-04-07. 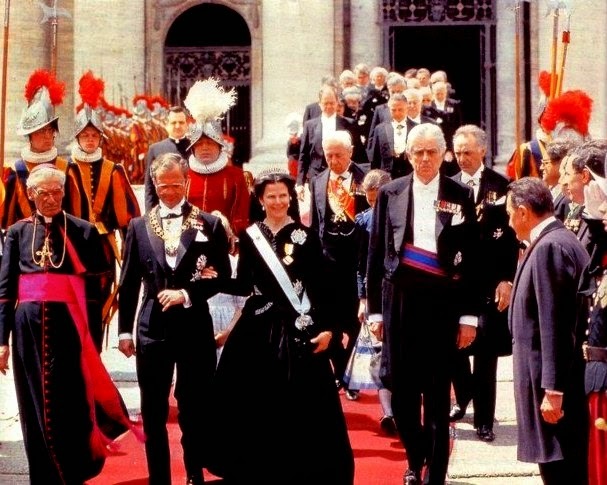 ^ Portuguese Presidency Website, Orders search form Archived 2013-04-04 at WebCite : type "RAINHA SÍLVIA" in "nome", then click "Pesquisar"
^ "Queen Silvia wore this tiara for a dinner during the State Visit to Portugal in September/October 1986. | Nine Prong Tiara | Pinterest | Tiaras, Portugal and Qâ€Ś". Pinterest. Retrieved 2016-04-07. 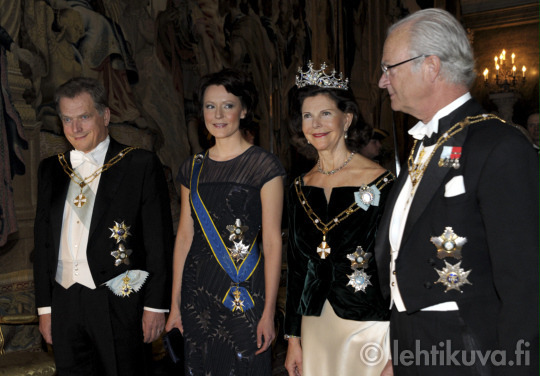 ^ "Queen Silvia wore this tiara for the first dinner during the Swedish State Visit to Portugal in May 2008. | Leuchtenberg Sapphire Tiara | Pinterest | Tiaras, P…". Pinterest. Retrieved 2016-04-07. ^ PPE Agency Photo among gala dinner gallery, ppe-agency.com; accessed 7 April 2016. ^ "Vestidos de Gala de la Reina Sofía | Jewels, Royals, tiaras | Pinterest | Vestidos, Tiaras and Spanish". Pinterest. Retrieved 2016-04-07. ^ "Statsbesök från Tunisien – dag 1 - Sveriges Kungahus". Kungahuset.se. Retrieved 2016-04-07. ^ Hellen Electra (2015-11-04). "NEWMYROYALS & HOLLYWOOD FASHION: Banquet for President Beji Caid Essebsi at the Stockholm Palace". Newmyroyals.com. Retrieved 2016-04-07. ^ "Queen Silvia of Sweden | Favorite Royals | Pinterest | Sweden, Diamond Tiara and White Gowns". Pinterest. Retrieved 2016-04-07. ^ "Photographic image" (JPG). Content.foreningshuset.se. Retrieved 2016-04-07. 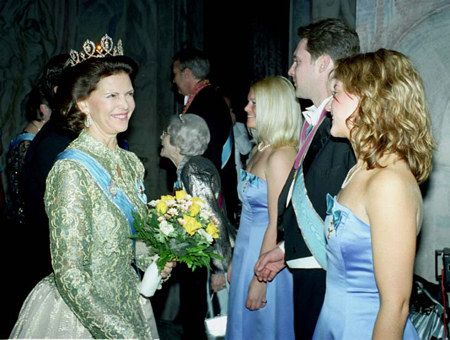 Wikimedia Commons has media related to Queen Silvia of Sweden.